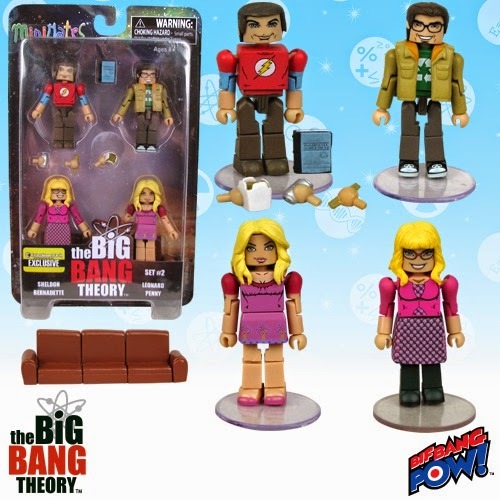 Are you ready for some Minimates based on The Big Bang Theory? Well, here they are! These wonderful figures from Bif Bang Pow! stand approximately 2-inches tall, include accessories, and feature your favorite geeks and other characters from the top-rated TV series in a collectible small size. They'll help you keep your pals with you at all times. Be smart - order yours now! Series 2 also includes these fantastic accessories: a Roommate Agreement, a soda can, a Chinese takeout box with chopsticks… and that famous couch! Collect both Series 1 and Series 2. Series 1 sold separately. Dr. Sheldon Cooper is smarter than you – and he’s not afraid to say so. A theoretical physicist possessing a master's degree, two Ph.D.s, and an IQ of 187, Sheldon is originally from East Texas, where he was a child prodigy, starting college at the age of 11. He has zero interest in romance, as his only real love is science (although his “girlfriend” Amy is constantly finding loopholes in their “Relationship Agreement” to disprove this theorem). He is a stickler for routine and is very different from his family; his mother, Mary, is a devout Christian, and his twin sister, Missy, is not a scientist by any means. Superpowers: Eidetic memory, Vexillology, Tuvan throat singing. Dr. Leonard Hofstadter is “Everyman” – provided “Everyman” has an IQ of 173 and Ph.D. in Experimental Physics. When he’s not doing research at the University, Leonard lives in a Pasadena apartment with colleague and friend Sheldon Cooper. Together, they proudly share a love of superheroes, video games and all things “geeky”. Leonard is also very earnest in developing his relationship with on-again, off-again, but now definitely on-again fiancé Penny, who lives across the hall. Leonard's family is composed of many accomplished academics including his mother, Dr. Beverly Hofstadter, and his brother and sister. Penny is the typical “girl next door” – if the girl next door happens to be beautiful (and technically lives across the hall). Originally from Omaha, Nebraska, she is an aspiring actress, who once moonlighted as a waitress. Outgoing and self-assured, Penny’s personality often contrasts with those of the guys. Although it’s not like they haven’t rubbed off on her, as she once developed an obsession with online fantasy games. Despite the fact that she and Sheldon don’t always see eye to eye, she has proved to be a good friend. Something of a leader to her friends Amy and Bernadette, Penny has become engaged to Leonard and started a new career in pharmaceutical sales. Weaknesses: Limited sci-fi knowledge, shopping. Dr. Bernadette Maryann Rostenkowski-Wolowitz – is a pint-sized scientist who, aptly, has a Ph.D. in Microbiology. Her height is a source of sensitivity for her, due to a childhood bully who once replaced her clothes with an elf’s costume. That was still too large. Bernadette is also not a huge fan of children. This stems from her forced employment at the illegal daycare center that her mother ran out of their home’s basement. Additionally, Bernadette’s father was a police officer. This is something that she admits caused her anxiety as a child as she worried about his safety constantly. She and Howard met on a blind date through Penny and instantly bonded through their mommy issues.